Spent the day at the Philadelphia Auto Show yesterday with K.C. 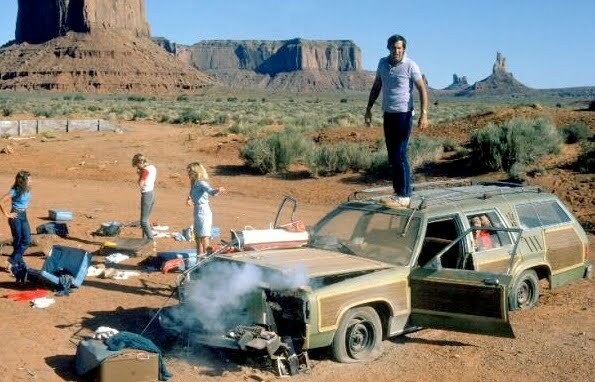 We're interested in upgrading the Griswold Family Truckster and have narrowed it down to a handful of smallish SUVs. My only requirements - it must have rear windows large enough to accommodate mass quantities of fishing stickers, and to keep the final price under $30K. As such, the Subaru Forester, Honda CR-V (aka the Mom-Mobile), Nissan Rogue, & the darkhorse Mazda Tribute seem to be the final four to sort through. I know, I know...no American cars...we looked at them and really liked what was going on with Ford, especially the Edge, but they aren't quite fitting in the budget. I guess Ford has some crazy idea that car companies are supposed to make money or something. No offense to the Chevy & Chrysler owners, but their 2011 SUVs were just claustrophobic. Thus, another weekend clearly went by devoid of fishing activities. To compensate, I hacked up made some small changes to my blog last night. I don't know if I'm set on them yet, but I'd love to get some feedback. Hack #1 - The blog is now wider (& the font is a notch larger). I've always wanted to have it so I could display pictures and videos BIG and really fill up the screen. I hate it when a website under-utilizes available screen space. Hack #2 - With the wider format, I needed a new header. I honestly don't like the trout, and will likely change it, but the old tenkara rod header didn't look good when resized to fit. Hack #3 - I added a "Reply" feature to the comments section. While it doesn't drop a "reply" directly beneath the comment you are replying to (like WordPress), clicking on it does automatically make reference to the original commenter, and if you click on their name after you reply, it automatically takes you back to the original comment. Make sense? Probably not, I did a crappy job of explaining that. Give it a try and let me know what you think. Some examples are already in the comments of this prior post. Anyway, let me know what you think. Especially the widening. ~ Gracias. Love the Family Truckster picture!! Really like the new look of the blog, might be asking for some tips here soon.. & good luck on vehicle shopping.. We just went through this a few months ago.. So far so good!! I like the wider format. Larger font is easier on the eyes. In reference to car shopping, Subaru vehicles are all the rage in CO, it seems everyone has a subaru. As do I...I absolutely love all of the "Vacation" movies. If you need any tips, you know where to find me. My current family truckster is an '03 Subaru Forester. I like it, but the backseat is just too small (Lilly's growing like a stringbean). Seems like the new Foresters have more backseat leg room, but less cargo space (with the seats up) in the back. Your dark horse candidate is an American in disguise... the Mazda Tribute (as many Mazda trucks and SUVs before it) is just a rebranded Ford... the Ford Escape to be exact. I don't know for sure, but a brief internet search indicates they may be built at the Ford plant in Claycomo, MO near Kansas City. Thumbs up on the changes, Mike. I think that the wider format makes reading the text more natural and gives more pop to the pictures. You could definitely tell they were virtually the same SUV. The only difference seems to be that Ford puts all kinds of technology in their version - like the Microsoft SYNC - which honestly I don't want and seems to drive the price up. I think I'm leaning toward just getting another Forester at this point. Some more online research (including real world pricing) to do and the test drives will come when the weather gets a little better. Sweet. Most people seem to like it. Looking for a naysayer. Where's Owl Jones or Cofisher when you need them? I love the wider format. If you're readers are still at 800 wide, reading this blog with a horizontal scroll will be their motivation to upgrade. Now tell us how to do the "reply" thingy. We love our Forester. We've had it for 10+ years and while it's asking for a lot of repairs lately, it's been a reliable car. We like the cargo space in an "SUV" that drives like a car (really, it was classed as a tall station wagon when we bought it). @MNAnglerIf I may ask, how many miles do you have on it? I've noticed the same thing recently...some bigger maintenance bills. Minor stuff, but it adds up. I've got about 90K. Hey Mike I like the look. You should be able to resize the header proportionately I would think. I just got a Merc. Mariner, same as the Ford somethingorother. Same size as the CR-V. I love it! Everybody in Colorado doesn't drive a Forester, just the Yippees. While widening is not necessarily a good thing in life (see waistline), in this case, it is nice. We looked at the CR-V's last year and ended up with a RAV 4 for my wife. The Honda just wasn't as well made IMO. The RAV has more room in the back seat too. The new blog layout is ok. I run Firefox with a sidebar , so it's a little wider than what shows on my screen. It's not cutting anything off really , but I hate having a scroll bar across the bottom of the window. I tried re-sizing and it was just too tall, took up too much of the page. I'll get something else in there...once I get outside. I sure find it a bit easier for me to read. I like things spread out instead of a lot of information jammed into a tight space. Like the changes and I will be checking into the reply button thingy. Thanks, Mike. Thanks Mel. If you liked it, it passed the test!